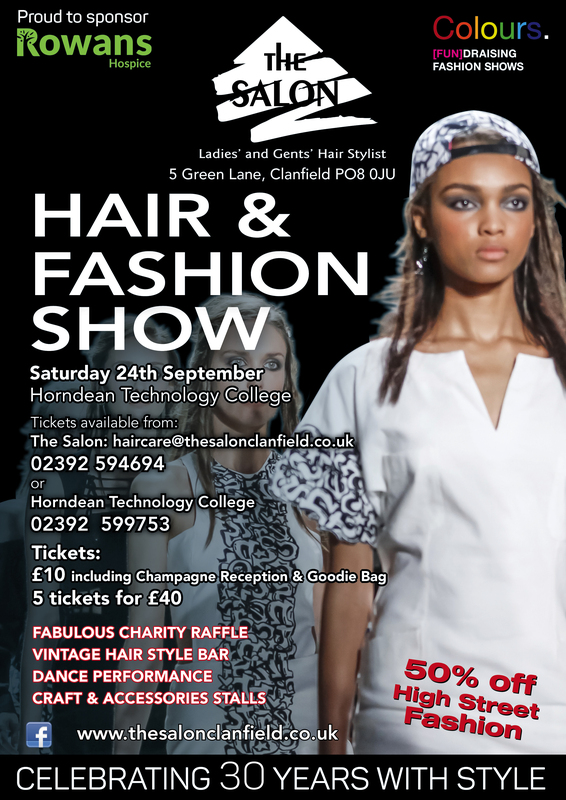 The Fashion & Hair Show will kick off with The Salon team demonstrating how past hairstyles still influence current contemporary hair designs. Some beautiful original vintage clothing supplied by Vintage and Vogue boutique of Petersfield will complete these looks. Today’s modern high street clothing will be provided by the Colours Fundraising fashion shows team. Providing full outfits and accessories attained directly from high street stores. These and more will be available for purchase with 50% or more discount. Then a short break will follow, with a charity raffle and further musical entertainment and a chance to get refreshments from the bar. A further fashion show will open the 2nd half, with more from the Colours team. The grand finale will be a flurry of prom and wedding gowns supplied by the Rowans Hospice trading company ltd, all topped with magnificent hairstyling inspiration from The Salon team. The Salon are proud to support the Rowans and pleased to help raise money for their latest project, a Living Well Center, providing support for patients and their families from the very onset of diagnosis. Please join us and bring along your friends for a fun and entertaining evening. We look forward to welcoming you all on the night. The Salon 5, Green Lane Clanfield.